Success is always less funny than failure. Sometimes labeling is only useful, like with OCD. Once you’re labeled you can be treated. On other occasions labeling leads to tyranny, like with childhood bipolar disorder in the U.S. Trying to solve the mystery is what I enjoy most about writing. There’s definitely evidence that capitalism at its most ruthless rewards psychopathic behavior. When you look at the worst corners of the American health insurance industry or the sub-prime banking market, it really feels like the more psychopathically someone behaves, the more it’s rewarded. Of course there are people who would like to eat breakfast without the screams of toddlers all around them, but those people should get over themselves and stop being stuck up and idiotic. Obviously, I like to write stories that are page-turners. But I always try my very, very hardest to be as factually true as possible. I think if somebody is so set in their ways about what they feel about something – and you get this a lot in academia, of course, and also different sorts of journalism too – you’re going to sweep under the carpet the facts that don’t suit your thesis. And I think that happens quite a lot in the courtroom, for instance. I have thought sometimes that the sanest people, the people who are just very balanced, very happy, are probably lower achieving than other people. My kind of irrationality happens to be fear or anxiety. Discover the time of day when you write best, and write then. For me it’s about 7 am to noon. For other people it’s overnight. Try not to do anything other than write between those times. You can say anything to David Icke and he will accept it and put it into his ideology. Yeah, but in the end his followers take what they want from his philosophy. Maybe it doesn’t matter what’s going on in David Icke’s mind. It’s how other people take him. Without sounding too pretentious, I was sort of a slave to the narrative. When the narrative cracks in, I have to go where it takes me. I had to go to the Bohemian Grove. It was the obvious end to the book. Well, I had nightmares when I was doing the Klan story all the time. I had a recurring nightmare of basically being exposed as a Jew inside the Klan compound. We have to understand how the extremists got the way they are. Without that kind of understanding, we’d never really get to know them. I put in nothing about their childhoods. But what I have put in is stuff about the weird symbiotic relationship between us and them. Nothing uniquely bad has happened to me in my personal life, but all the regular little bad things have accumulated to make me a neurotic person. And these adventures are my way of trying to make sense of that. No, people back home don’t realize why there is this kind of need for heroes in America at the moment. People in Britain don’t really understand what’s going on here. They don’t understand why Camp X-ray exists. My paranoia never ends, but I haven’t been paranoid about being spied on my shadowy forces for some time now. I’m not what you’d call a fearless type of person. I wasn’t in any way a kind of soothsayer or not surprised when Sept. 11 happened. I was absolutely shocked. I did feel like they were telling me that something like that was going to happen. Not specifically – not that planes were going to be flown into the World Trade Center or anything like that – but in the general sense. 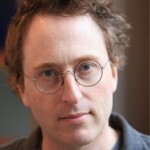 Jon Ronson was born in Cardiff, Wales. He is a Welsh author, documentary filmmaker and screenwriter. He earned a degree in Media Studies at the Polytechnic of Central London. He directed several documentary films include: The Secret Rulers of the World (documentary series) and Stanley Kubrick's Boxes. He has written several films include: Stanley Kubrick's Boxes (documentary film), Frank, and Okja. He has written several books include: Them: Adventures with Extremists, The Men Who Stare at Goats, Out of the Ordinary, The Psychopath Test, Lost at Sea, Frank, and So You've Been Publicly Shamed.